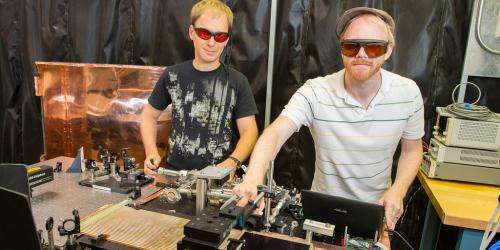 Andrey Elagin (left), postdoctoral scholar at the Enrico Fermi Institute at the University of Chicago, and Matthew Wetstein (right), the Grainger Postdoctoral Fellow at the Enrico Fermi Institute at the University of Chicago, adjust the optics in the Large Area Picosecond Photodetector testing facility at Argonne National Laboratory. The facility uses extremely short laser pulses to precisely measure the time resolution of the photodetectors. Scientific particle detectors, medical imaging devices and cargo scanners with higher resolutions and cheaper price tags could become a reality, thanks to a three-way collaboration between industry, universities and U.S. national laboratories. Pulling together expertise from a variety of scientific disciplines, a team of scientists has designed a photodetector system that detects the arrival time of light with a hundred times more precision than most conventional photodetectors, while also improving spatial resolution by a factor of 20 to 100. The project also seeks to reduce manufacturing costs, making commercialization of large-area detectors viable. "If we are successful, this will make photodetectors available to a broader community of scientists," said Matthew Wetstein, a particle physicist in the Large Area Picosecond Photodetector collaboration (LAPPD) and the Grainger Postdoctoral Fellow at the University of Chicago's Enrico Fermi Institute. The LAPPD project draws scientists from the University of Chicago, the University of California at Berkeley, the University of Hawaii at Manoa, and the U.S. Department of Energy's (DOE) Argonne and Fermi national laboratories. At Argonne, the LAPPD project includes the High Energy Physics and Energy Sciences divisions, and the Advanced Photon Source. Incom Inc., a Massachusetts-based fiber optics company, has partnered with LAPPD to develop prototypes for industrial-scale manufacture. The manufactured plates would be made commercially available to be used in both scientific research and instrument construction. A cover story in the June 2013 issue of Review of Scientific Instruments (RSI) highlights the breakthrough design and the facility built to test the new detectors. "We have been putting a lot of hard work into this project, and it's great to see it coming to fruition," said Bernhard Adams, an X-ray physicist in Argonne's X-ray Science Division and an author of the RSI paper. Photodetectors are light sensors with a broad array of applications. In X-ray science, these detectors can help researchers design new pharmaceuticals, create new catalysts, and hunt for defects in materials and manufacturing processing. In particle physics, photodetectors record the type and path of subatomic particles, such as those created in the interactions of neutrinos, to allow researchers to learn more about the building blocks of matter and how the universe evolved. Photodetectors are also used in homeland security to scan large shipping containers, and in medical imaging, such as positron emission tomography (PET) scanners. The photodetectors LAPPD works on are called microchannel plate detectors, because their main component is the microchannel plate, or MCP. Unlike lower-resolution photodetectors like photomultiplier tubes, MCPs can detect particles with time resolutions measured in picoseconds and produce fine-grained, high-resolution images with spatial resolutions below 10 micrometers. The project is intended to make the manufacture of MCPs cheaper and easily scaled up, producing MCPs in larger sizes and quantities. LAPPD's standard plates are eight-inch squares, much larger than the 2-inch plates presently available. These detectors may be produced more economically because the system is modular: multiple plates share a readout to cover large areas with a modest number of electronics channels. This streamlined system will allow photodetectors to quickly scan objects as large as trucks for nuclear materials and will reduce the cost of large-scale, high energy physics experiments. Until now, MCPs were expensive, made from a fragile type of glass. The LAPPD design incorporated the expertise of Joseph Gregar, Argonne's Scientific Glassblower, to use inexpensive window glass to construct the plates. This more robust material enables the plates to be made larger. These glass plates are then coated with a thin resistive film using a technique called atomic layer deposition, or ALD. This unique coating technology was developed and provided to the LAPPD project by Argonne scientists Jeffrey Elam and Anil Mane, both from Argonne's Energy Sciences Division. The LAPPD group is working on making this breakthrough available to industry, and entered their partnership with Incom Inc. through DOE's Small Business Technology Transfer program. The researchers are convinced that this high-risk, high-reward R&D effort likely could not have happened in industry alone. "The cross-disciplinary collaborations in this project have allowed us to consider many different applications," Wetstein said. "This project could be the start of something big."